No Hebrew this time, ranting once is more than enough. 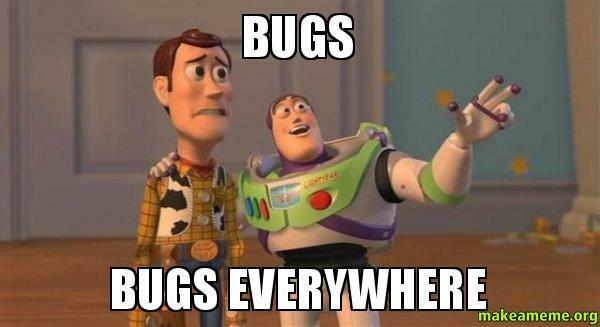 Every now and then, there's a deluge of memes and semi witty remarks on what appears to be testers favorite subject - bugs. Usually, bugs created by the oh-so-incompetent developer. Well, I have a request for you - If you are about to create, post, retweet, or in any other way share such a hilarious pun - please don't. Yes, I'm sure that everything is done in good spirits, and it's only a harmless way of venting out. Besides creating and enforcing a useless barrier between testers and developers (which, I hope everyone posting such stuff is aware of this side effect), this unproportional focus on bugs also portrays testing in the very narrow aspect of bug-hunters. It diminishes every other aspect of testing - exploration, collaboration, risk-analysis, facilitation & acceleration of shipping stuff - and focuses on obvious bugs, probably the single most superficial thing there is to testing. So yes, sure, a joke. Sometimes it's even a funny one. Just remember that humor is one very effective way to convey ideas and make them stick. So i would appreciate it if you would stop doing that. Thank you. 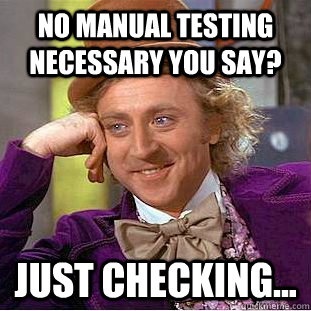 Also, I have a challenge for you - Find some memes about testing that aren't about bugs or bashing developers, and share them the next time you encounter some of those. Here's one I found: A bit of an internal testing joke, but still.